for nominating me for the “WorldPress Family Award”. When I started blogging, I had no idea what I was in for. All I wanted was a platform to write my autobiography, my true life story. Choosing WordPress had connected me with fellow like minded bloggers and even earned Awards. This is probably one of my most fulfilling new hobby that I am at the moment pretty intensely involved with. 1. Display the award logo on your blog (see above). 2. Link back to the person who nominated you (also see above). 3. Nominate 10 others who have positively impacted your WordPress experience (see below). 4. Don’t forget to let your WordPress family members know of your nomination. 5. That’s it! Just pick 10 people that have accepted you as a friend, and spread the love! Most if not all of my nominees had visited my blog, posted comments and build the connection with me in my short time of less than two months with WordPress. I had previously nominated most of you for “One Lovely Blog Award” and/or “Shine On Award” and I still believe you deserve this “WordPress Family Award” too. Without further adieu my nomination goes to the following 10 bloggers. I considered all of you as my WordPress friend and I hope you have accepted me as a friend too and let’s spread our love to the WordPress Community. This entry was posted in awards and tagged A Lovely Blog Award, postaweek, Shine On Award, WordPress Family Award by Little Borneo Girl. Bookmark the permalink. Congratulations! 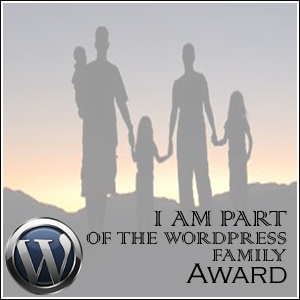 Thank you for the nomination, I am honored to receive The WordPress Family Award. I will nominate 1 or 2 bloggers. If this is a problem, please let me know. Happy Blogging! If I didn’t say it before, thank you again for the nomination, I am working on the re-post, so far I have placed the badge on my page, and noted that you nominated me! 🙂 Keep up the wonderful blog you have!! Sweet of you to consider me part of your WP family. 🙂 Thanks, and congrats on the award yourself!